Get ready for Quentin Tarantino's glorious 70mm roadshow extravaganza, coming to a movie theater near you. The Weinstein Co. has confirmed and announced the list of 100 theaters in 44 cities that will be showing Tarantino's The Hateful Eight in 70mm, with intermission. The snowy western is about a group of "hateful" bounty hunters trapped in a cabin in a blizzard. We've been reporting on details for the 70mm release, including this excellent featurette that explains what it all means, but now they've released the full list and tickets are on sale. 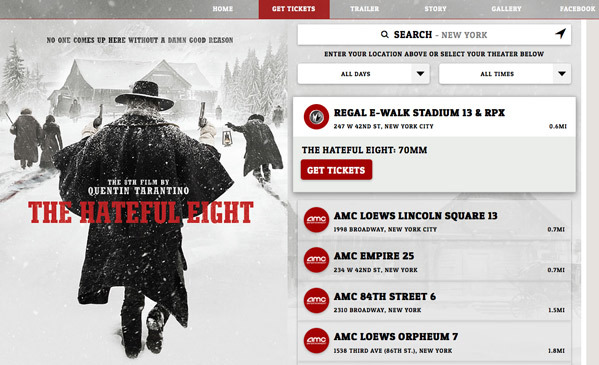 You can find your nearest 70mm-equiped cinema be consulting the ticketing part of The Hateful Eight website. If you're a fan of ultra-wide panavision cinematography, this is do-not-miss. The markets include New York, Los Angeles, Chicago, Philadelphia, Dallas, San Francisco, Boston, Atlanta, Washington DC, Houston, Detroit, Phoenix, Seattle, Tampa, Minneapolis, Denver, Miami, Cleveland, Orlando, Sacramento, St. Louis, Portland, Pittsburgh, Milwaukee, Charlotte, Raleigh-Durham, Baltimore, San Diego, Nashville, Kansas City, San Antonio, West Palm Beach, Birmingham, Las Vegas, Albuquerque, Oklahoma City, Austin, New Orleans, Providence, Knoxville, Santa Barbara, Toronto, Montreal, Vancouver. For tickets and info on the venues or the film, visit the official site: http://tickets.thehatefuleight.com. It has been reported that Tarantino has been rallying movie theaters to re-install 70mm projectors just for this opening. It's linked to the idea that hopefully filmmakers will keep 70mm screenings going in certain places all year, every year. Variety states that these 44 markets and 100 theaters committed for The Hateful Eight make this "the widest 70mm release in 20 years." It's great to see so many movie theaters stepping up. I wish, so hard, I was in America still. Success! I will be seeing the Roadshow Dec 31! Super excited! Toronto: I spoke with Varsity Cineplex and they told me that they are waiting for an email from head office to put up showtimes for the 70mm showings. Once they do, the website will be updated to pre purchase tickets. He told me that for the LATEST tickets will be available to sell by Tuesday December 22nd, and by the earliest, it would be tonight (guessing on that last part obviously).